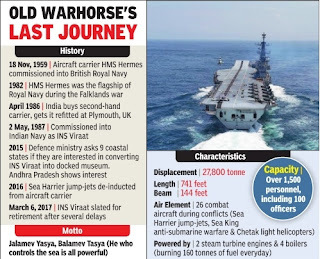 India's oldest warhorse with 30 glorious years of service in the Indian Navy is in danger of being junked and sold for scrap. 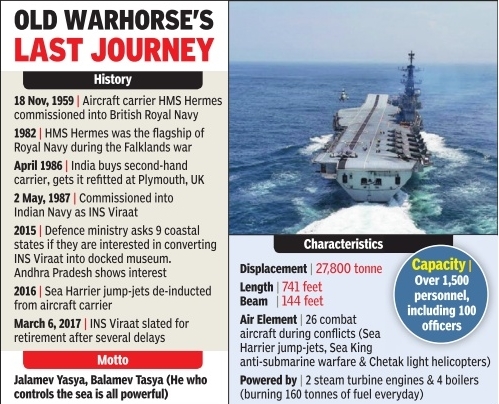 With March 6 being fixed as the final retirement date for the 58-year-old aircraft carrier INS Viraat, the proposal to convert it into a museum is yet to take any concrete shape. Defence ministry said it may be forced to scrap the 27,800-tonne carrier, which saw operational service in the Royal British Navy for 27 years before being inducted by the Indian Navy in 1987, because of the continuing imbroglio with the Andhra Pradesh government over who will foot the bill. 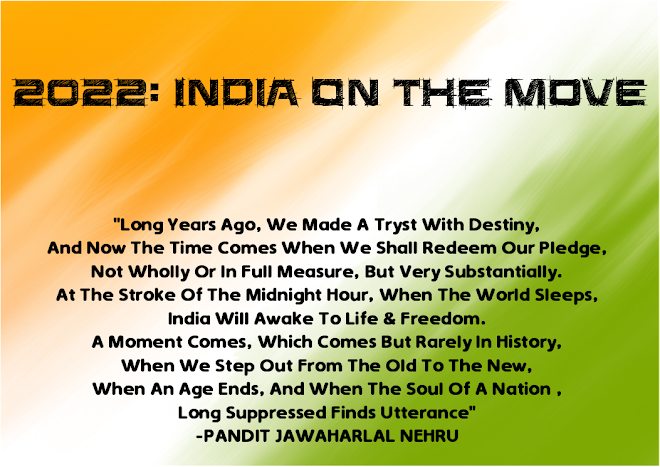 The carrier will now be decommissioned at Mumbai on March 6 after several delays. The farewell for the “grand old lady“, which will witness the Tri colour, naval ensign and commissioning pennant being hauled down for the last time at sunset, will be attended by Navy chief Admiral Sunil Lanba and many Indian officers associated with the carrier as well as around 20 British naval veterans.